Whether you’re newly engaged or you’re almost done planning the final details of your wedding, bridal expos are a great opportunity to meet local vendors, learn about tools to ease the wedding planning process and get great ideas to incorporate into your big day. Here are a few tips to help you get the most out of your bridal expo experience! If you haven’t already, create an email address specifically for all things wedding-related. Nowadays, email is the primary method of communication used between brides and their vendors, and at bridal expos you will be asked again and again to write your email and contact information on mailing lists and entry forms. Most vendors you meet at the expo will then be emailing you to follow up with things you might have discussed during the expo, to provide more information about their services, or to offer you special deals or discounts. Rather than letting all these vendors clutter your personal email inbox, set up an email account for wedding related business only. Just remember to check it frequently and to reply to all the vendors whose services you’re interested in! Have a plan. Take the time to do a little research about the bridal expo you’ll be attending, so that you know what to expect. If the expo is large and there will be a lot of vendors, keep in mind that you might not have the opportunity to stop and speak to every one, so concentrate on finding the vendors whose services you know you need. If there is a vendor you’re already interested in and you know that they’ll have a booth at the show, make visiting their table a priority. Also look for a schedule of events–such as fashion shows and raffles–so that you don’t miss out on those! Prepare a few questions for your vendors. You don’t want to just go to every booth, pick up a flyer or pamphlet and move on to the next table–vendors are there to answer all your questions, so you should have some questions to ask! Take a couple of minutes to write out a few things you want to find out more about–whether it be about their rates, availability, or you just want more details about their service. Vendors will be more than happy to answer your questions, and you’ll get all the information you were hoping for. Bring printed address labels with your contact information and wedding date. As I mentioned earlier, you’ll be asked for your contact information a lot during bridal expos. Rather than having to spend a couple of minutes at every booth writing out your information, come prepared with a few sheets of printed address labels with your name, address, phone number, email and wedding date, so that all you have to do is peel and stick that label onto all those sign up sheets. It’ll save you time and it’ll save you from writer’s cramp! Bring your parents, groom and/or a friend. Walking and talking to vendors all day can be hard work, and you shouldn’t have to do it on your own! If your parents, groom or a friend are taking part of the wedding planning process with you and you know you’ll want their opinions, bring them along to the expo. They can help you find vendors, remind you to ask questions you might have forgotten, and overall be a big help as you make your way through the expo. Bring a bag to keep all the brochures, pamphlets and any freebies you’ll be given. Vendors will be handing you all sorts of things throughout the expo and you’ll need a place to put it all– so bring a bag! Often when you arrive at the expo you’ll be given a canvas or plastic bag to carry everything in, but don’t assume that they’ll be available and be prepared with your own, just in case! Bring your calendar or appointment book. You’ll likely meet a few a great vendors during your time at the expo, and rather than waiting a few days to email back and forth and schedule a time to meet, book your appointment with them while you’re there at the expo! Vendors come ready to schedule meetings and appointments, and often offer specials or discounts for booking during the show. Take advantage of this, and bring your calendar so that you can schedule an appointment or book your vendor then and there! Wear comfortable shoes. Expos are often half a day long, and you’ll be spending all that time on your feet, walking around and speaking to vendors. Come prepared with a good pair of shoes that you know won’t leave you with aching feet! Have fun. The whole wedding planning process should be enjoyable, so bridal expos should be too! Sign up for raffles and win prizes, head to where the caterers and bakers are and try out a few samples, and take the time to check out any fashion shows or activities going on. You’ll learn a lot and have a good time too! One of the most exciting things to do once you’re engaged is finding the nearest grocery or convenience store and picking up the latest bridal magazine. We’ve all been there — you run home and scour the pages of gorgeous gowns, folding down the corners to mark your favorites and you get giddy at the thought of trying on dresses in the coming weeks. After picking up a few more magazines and reading them cover to cover you’re ready to schedule your first appointment. It’s easy to focus on the silhouettes, fabric and details that you like, but you should also consider the designers when flipping through those pages. What’s their price range? What do they specialize in? Where can you find them? It’s best to find the designers’ authorized website to get all the details. After perusing their website, you can use their store locator to find the nearest retailer to you. Feel free to call the retailer and ask them questions you may have about a particular designer and then book your appointment! Choosing designers is fun for us, too! We do our research and pick those we know our brides will love. I’d like to brag a bit on one of our all-time best designers — Casablanca Bridal. Casablanca has been with us from the early days and continues to be a true favorite for many of our brides over the years. They have a great team behind them who work hard to produce incredible gowns. As a Casablanca bride myself, I may be a bit bias in saying that their gowns are the full package — but seriously, they are. The styles are nice blend of classic and fashion forward. The fabrics are beautiful and of great quality and the structure and fit are superb. What myself, other brides and SWAK consultants like most is the option to customize almost anything with the dress. Brides have moments where they think they’ve found ‘the one’ IF ONLY they could…add straps, change the neckline, the fabric, the shape, etc. — with Casablanca, you can do that! The possibilities are endless and we’re often surprised when we get ‘yes’ responses to enquiries that seemed difficult or impossible. What’s even better is the fact that they can make your gown to your measurements. Yes, I’m aware other designers offer this, but typically it’s at a pretty high price point and is mostly seen with couture gowns only. It’s rare that our bodies are completely proportionate and fit perfectly into a standard sample size — for you ladies who do, kudos to you! The other 98% of us often need to have our gowns tailored to fit exactly how we want them. Casablanca encourages consultants to get a series of measurements including bust, waist, and hip measurements as well as hem length to ensure that your gown is as close to fitting as possible when it arrives. We all don’t choose the first gown we try on or have that moment when we break down in tears because we know we’ve found it. Finding your gown is a process. You want your gown to be a reflection of you, your personal style and how you want to appear and feel on your wedding day. What better way to make it your own by customizing it to suit YOU. Have you ever wondered what a wedding dress symbolizes? Why it’s so important? Or why they’re traditionally white? During and immediately after the Middle Ages, many weddings were a matter of politics rather than a matter of love, especially in the higher social classes. As a result, brides were expected to dress in a manner that would represent the wealth of their family in a favorable way, since the brides weren’t representing only themselves in the ceremony, but their family and status. The brides of wealthy families would dress in very bold colors with luxurious fabrics like velvet, silk and furs. Over the centuries, brides continued to dress themselves on their wedding day in a manner befitting their own social status, and always in the height of fashion, with the richest and boldest attire that their money could buy. The poorest brides wore their best church dress for their wedding. Every detail of the wedding gown, from the number of layers to the amount of fabric needed to create it, was a reflection on the bride’s status and wealth. Today, wedding dresses are available in all price ranges and come in hundreds of colors and a variety of lengths, which is now considered acceptable. Women can purchase ready-made gowns, wear a family heirloom, or they can have a dressmaker create one for her. Plus, nowadays many bridal shops have wedding dress samples in their stores where the bride can choose a certain dress style and order it to fit them. Style, color, and ceremonial importance of the dress depends on culture and religion of the wedding guests and participants. The color white for weddings and dresses didn’t become popular until after Queen Victoria’s marriage to Albert of Saxe-Coburg in 1840. The queen wore a white dress for the special event to contain some prized lace she owned. Her wedding portrait was published widely, and many other brides chose white in accordance to Queen Victoria’s choice. After the Victorian era people began assuming that white represented purity (when traditionally blue represented purity). The white gown is, in fact, a symbolic Christening gown. Only at the beginning of the 1920s did white wedding fashion represent the bourgeois-churchly moral: the virginity of the bride which equates purity. Most brides choose a white dress to symbolize purity of the soul. Traditionally, wedding dresses have been based off of the popular styles of the day. For example, in the 1920s the traditional style was short in the front with a longer train in the back and a cloche-style veil; in the 1940s the traditional style was long, full-skirted designs brought back from the Victorian era; today, the dresses are usually a shade of white, such as eggshell, ecru or ivory. Although there has always been a dress style that dominates the bridal market for a certain time and changes along with the popular fashions, a growing number of brides these days aren’t choosing to follow the trends. 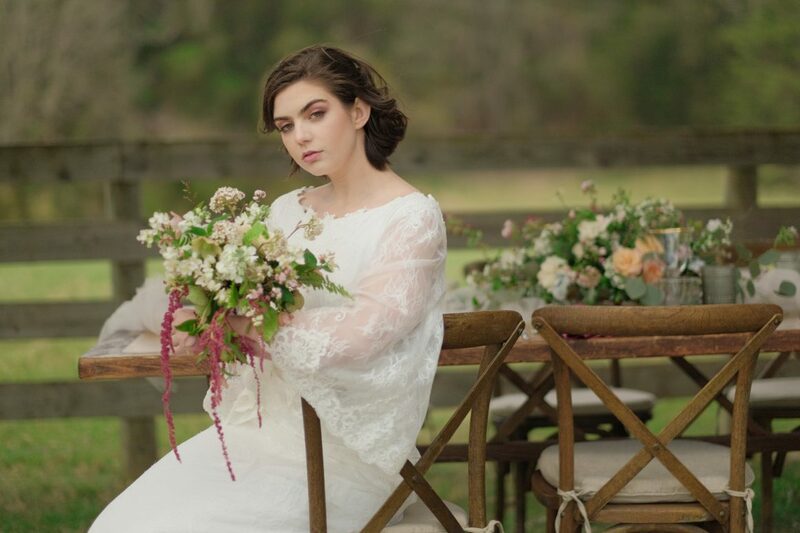 Times have changed, and due to non-traditional weddings, non-first-time weddings, and women who are getting married in their later life, wedding gowns are more likely to reflect a bride’s individuality and personal style. Check out this great video from Mode.com of how wedding gown fashion has changed in the last 100 years–it’s hard to believe what brides used to wear! When Amanda first met Micah, she didn’t like him very much. Amanda had been working at the Blue Light Grill on the Downtown Mall in Charlottesville, when Micah started working there. Amanda said that Micah changed a lot when he came to the Blue Light Grill, and at first she didn’t like the changes or Micah, but she soon grew to admire him and his work ethic, realizing that he was a good guy. They began flirting, which soon led to dating, and slowly her love for him grew strong. Amanda told a story of a big date Micah and her went on, where they visited three different watering holes, went on a hike, and then ended the day at McGrady’s Irish Pub, where they would later have their wedding reception. She decided that he was the smartest and sweetest guy she knew, which made her excited and a bit scared. Amanda didn’t see the proposal coming. She knew Micah had planned a romantic date (of which she told a girlfriend about, who guessed Micah might propose), but it just wasn’t on Amanda’s radar. The day of the special and romantic date arrived. Amanda and Micah had a tasting at Clifton Inn and then were having a nightcap. Out of nowhere, Micah dropped down on one knee and pulled out an engagement ring. Amanda was so stunned that she couldn’t process what was happening right away. When Micah saw Amanda’s face, he actually stood back up to make sure Amanda was alright and that nothing was wrong. Once Amanda finally registered what was happening, she began jumping around and asking if what was happening was real; she was so incredibly and unbelievably happy. Earlier, Micah had stashed a bottle of champagne outside, and once Amanda said yes he retrieved the bottle and he and Amanda toasted to their new life together. When Amanda was asked how she found THE dress, she answered that she was looking for something lacy and Gatsby-esque. Our owner, Susan, then brought a particular dress from the Richmond store for Amanda to try. The dress had a separate lace overlay, and when she first caught her reflection in the mirror after putting the dress on, her first and immediate thought was, ‘Get this off of me.’ After a moment, Susan realized they had actually put the lace overlay on backwards, so they fixed it, and that’s when Amanda decided that the dress was perfect.